Analyze any Facebook page. Just edit the page name and refresh the report. Reuse the report on as many Facebook pages you wish to load. No need to be the page administrator. Analyze ANY Facebook page. You don't need to be the administrator of these pages. Just set the page Facebook name (e.g. HBO, as found in https://facebook.com/HBO), and the report will load the page’s data. Identify posts with the highest number of shares and comments. Find the most effective keywords, or common comment phrases. Find the most effective day of week and hour of day for the highest number of shares. Find the pages that comments on posts, and drill down to their comments (can be spam messages, or responses by the page owners to user complaints). The page's picture / logo and title are loaded automatically. No need to customize the report manually. Use Power BI to customize the report to meet your needs. 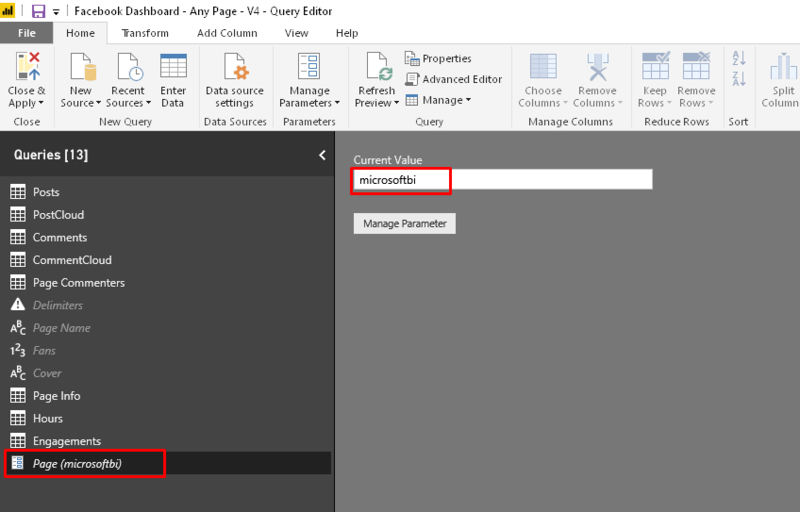 Open the pbix file using Power BI Desktop, and click Edit Queries. In Queries pane, select Page parameter and provide the Facebook object name in Current Value. Once you set the Page parameter, click Close & Apply and load the report. 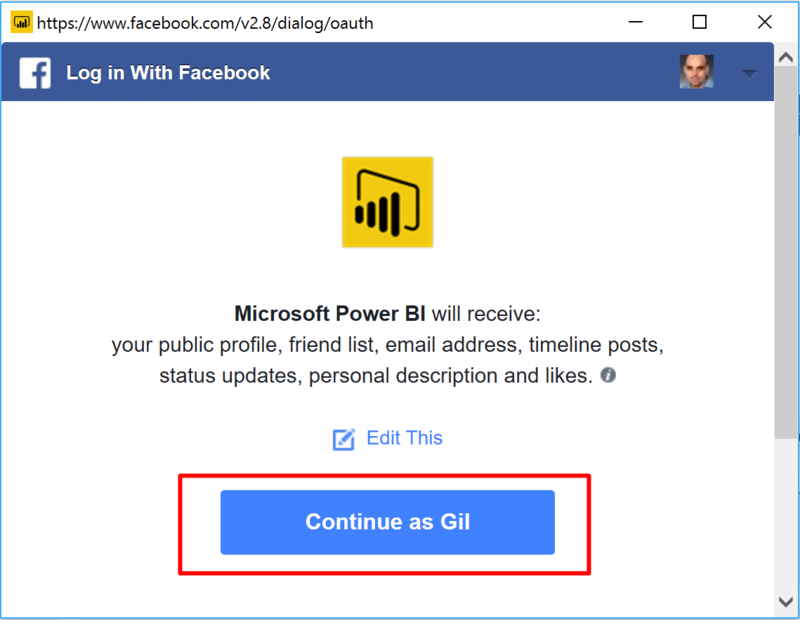 If this is the first time, you connect to Facebook in Power BI Desktop, click Sign in. Proceed with the Facebook App approval steps, and click OK. When you are back in the Access Facebook dialog, click Connect. Depending on the page you decided to load, the refresh may take few minutes.